A new mod claims to unchain Battlefield 3 from Origin and enable the editing of hidden dev features. Multiplayer shooters these days are locked down tighter than a Valve NDA. Justifiably concerned with cheating, altering any game file can lock you out of many popular titles. 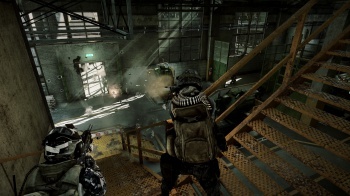 NoFaTe, a mod group who previously unlocked Bad Company 2, is turning their attention to Battlefield 3. Their upcoming project, Venice Unleashed, claims to enable modding, all without getting yourself banned. As the website proclaims, "using our powerful Extension System, which exposes lots of engine/game functions and abilities, you can now create your own unique mods and gamemodes, without the need of performing complicated and game-breaking file modifications." It seems that most Venice Unleashed is about playing around with hidden game settings. This could be anything from changing the color tint and lens flare to running servers with custom rulesets. Venice Unleashed seems to be an emulator that runs on top of Battlefield 3. Lest you think that it's just another tool for pirates, Venice Unleashed does require a legit, activated copy of Battlefield 3 to function. The project is currently in closed beta, because it's important to work the kinks out when your entire Origin account is on the line. Interested parties with the requisite amount of courage (and trust) can sign up here. Now that Battlefield 4 is on the way, perhaps the third iteration will have new life with a variety of creative mods and custom maps. Or the whole thing could get shut down with some new security measures, who knows.